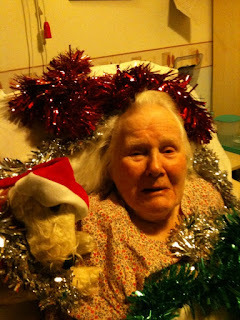 Positive Letters .... inspirational stories ....: Mum and Hardwick - decking out the tinsel .. I feel as though you’re taking me for a ride – my mother’s comment as I appraised the Christmas decorations I’d packed away two years ago – not able to remember what I’d kept. This year my Ma has decided she’d like some decorations in her room .. so I must still go to work. I tipped the box out and spread the tinsel out around her and over Hardwick .. this was when she said “I feel as though I’m being taken for a ride”! I feel as though you're taking me for a ride?! Hardwick is a very special life like dog – he goes everywhere now with Mum ... either in her mind, or to the hospital .. and amuses everyone, as he’s so real and often mistaken as such! Below: Hardwick - the favoured one! & "I'm not posing"! 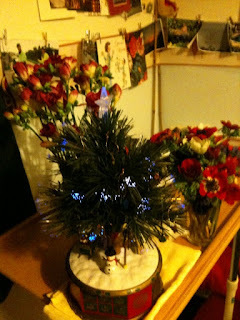 The Christmas tree (below right) was given to Ma a few years ago by Elizabeth, her great friend in Cornwall, it plays a few tunes with the lights on, or just has the lights on twinkling away – she loves it! I rather hope she’d say she didn’t want it .. the tunes are ‘chippy’!! Good thing I didn’t give it away 2 years ago - isn’t it.. this is now its third year by her bedside?! The flowers, which weren’t at their best, are anemones from Cornwall – they are jewel like colours and we all love them, pink freesias, then on the tv table – that we don’t watch – are narcissi and chrysanthemums – all replaced today – pink tulips instead, and a mass of narcissi, from Cornwall again. The jewels weren’t available – sad: Mum loves them. 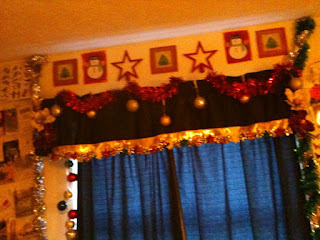 Please spot the snowman on the made-up frieze above the window - Mum likes the dark curtains they keep out the light. These pictures are all taken with an Apple iphone on a December afternoon in England! I'm impressed - just emailed and transferred across?! I call him Mr Frosty-Face! Too right Mr Frosty you’re here to stay with us I suspect, at this unseasonal snow fell before Christmas, with more threatened. Some lights from the harbour at Newlyn – my Ma’s Care Home overlooked this harbour, with views across Penzance, St Michael Mount’s Bay to The Lizard .. wonderful at all times of the year for the patients – as there was always lots going on out of their rooms or from the large window fronted sitting room. Now the corner of the room that my Ma can see is decorated .. so more pictures .. up above the window (see above) – sit two Mr Frosties – mirror images .. 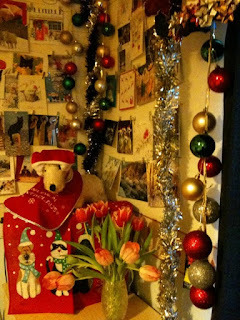 This small amount of area (only a corner and round the window) of taking down previous cards, putting up Christmas cards – making some “whizzy” of the decorations .. and even though I say it myself – I think it’s pretty good - & my mother is amazed – she wakes up to decorations .. The first thing she said to me was – thank you .. and aren’t they wonderful, and how clever I’d been – she is truly a star! Dear Mr Postman .. these pictures may not be very large – we shall have to see and then I need to learn what to do ... this took me a mere 12 hours .. and it’s tiny! Oh well .. it’s bringing huge pleasure. Mum think Hardwick’s outfit is very special. In fact emailed iphone pics have turned up trumps!! The decorations are great I can imagine she wake up with a smile! Tell her Merry Christmas from the Utke family! Hi Joanne .. thanks so much - the decorations seem to be much appreciated and with fresh flowers around will cheer her up. I will tell her you sent her Christmas greetings - you too have a lovely time with the kids .. enjoy the fun! What a wonderful thing you did for your mother, bringing some Christmas cheer to her! And I think that's what it is all about - giving from the heart. Merry Christmas to you and your mother! What joy coming over today and finding such Christmas spirit. The photos are fun and happy and make the room so love-filled and happy. The dog is a hit and to think of this as his third year...what dedication. I send warm and loving wishes to you and your Ma and have so enjoyed the photos and now with what you write I feel I know her. Happy Holidays and may your life overflow with all the joy you share! Hi Lance .. thanks so much for stopping by. Yes - she is hugely pleased .. and a good talking point for the staff etc. As you say a labour of love - but we'll enjoy it. Hi Tess - THANKYOU! Just so pleased the pictures are being enjoyed .. I'm sure she'll be pleased to share this story! I'm amazed at how good the photos are .. Apple iphone "I love you"! Hardwick we think could be 93 or maybe even 103 .. not sure - he was owned by a man, who was older than my Ma - she nursed him in her Care Home (she's now in her 90th year). Thanks Tess - for feeling you know my Ma better having seen her enjoying her Christmas decorations with Hardwick by her side. Hi Barbara .. ok - glad it's appreciated. Glad the family fire is up and running Janes was quite enthusiastic for it!! What a dear dear daughter you are. A blessing! Your Ma is so lucky to have you. 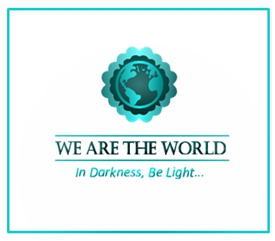 What amazing things you have done for her to make the holidays brighter than usual. And Hardwick is a cutie pie. I hope you will have a joyful time with her and all this Christmas. Thank you for sharing this with all of us. It has been a real pleasure to "meet you" this year and I trust we will get to know each other even better in 2010. May you and your sweet mother have much joy and inner peace in the days ahead. i reely reely lieks yor dekorashuns!! mebbee some days i can go across teh oshun and see you, and yor decorashuns? and the ships wit lites on them? and we driks a cup of tee. and eats a krumpit? and enjoyes some klotted kreems? wit love and affectshuns, your new frend, blue bunny from my jannie's blogg. s.p. i lieks darke kertins too, tehy keeps out the shiny moon wen i tries to sleep. i iz going now to bedd. Hi Jan .. thanks - Mum is very pleased and always saying how brilliant the room looks. Hardwick is a complete star! Thank goodness for him. Today we're going to listen to the Festival of 9 Lessons and Carols from Kings College, Cambridge this afternoon. Tomorrow we'll listen to the Queen's message and mix and match in between - i.e. same as ever .. around if she's awake, otherwise being with the family. We'll all visit on Christmas Day. Thanks so much it's been such an amazing year and it's been staggering to be a part of this group of commenters, and to enjoy 'meeting up' with a great many. I too intend to be around in 2010 and look forward to 'spending more time with you'. Enjoy your Christmas and New Year .. and thanks for your wishes and our inner peace. Hi Blue Bunny - good to see you here. sometime - yes you must come over the Ocean .. but the decorations will probably be down .. unless you can burrow under quite soon! I don't know if the ant routes wiggle their way under the Ocean and you could make yourself skinny enough to slink thru? Of course we can drink tea, eat crumpets with black currant jam, and clotted cream - or thunder and lightning (clotted cream and golden syrup) - mmm delicious! 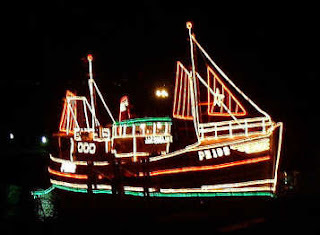 The ships look so wonderful - lovely site at christmas time. Thanks Blue Bunnie - Hardwick is especially pleased to meet you - he loves cuddling up with a warm body. Yes - I'm sure the curtains keep the moonlight out .. as it twinkles across the sky. Hope you had a good sleep and are still sleeping peacefully - gathering your strength to keep Kelly company and watch her enjoy her prezzies .. remember to eat your carrots. Hilary, wishing you and your mother a Christmas fills with Love, Joy and Peace. Hi Bk - thanks for coming over and for your wishes for my mother, the family and I .. The tree with tunes reminds me of one of my early Christmases. It might even be the first Christmas that I was old enough to have a lasting memory. Hi JD .. good to see you - and I'm pleased I've brought back some early memories for you. The little Advent tree with its little boxes (as I now know - Advent .. one box a day) - the lights or tunes have been constantly on for her. Thanks you. I just woked up. I have a new squirrel frend. I calls him Hardwick. I did true to tunel under the Oshin but there is so mutch hard hard rocks in texis I onlee made it to the gardin gate. evin the texis ants finding the rocks too hard. Yet my lovily hilary, I feels liek I iz there wit yoo in speeritt ennyway. and my Jannie and my Kelly iz sending you a big love yoo. Well , back to my bloging jobb now, my Jannie wanting me to dust off all she widjits. and straten she jpegs. Hi Blue Bunny - were you sheltering from the snow? Hardwick will be very pleased to know he has influenced you to call your new friend after him .. he used to like watching squirrels darting up and down the trees - but he just looks at the decorations or talking to his mistress or the staff. He has lots of laughs. We would love to have seen you here - but the Oshin is very big .. let alone getting past the Texis rocks. Blue Bunny you are causing much fun here - everyone wanting to know how we know you and how we get on so well and enjoy each other's company .. Hardwick loves friends. My Ma, Hardwick and I all send you a big bunny hug and wish you much fun during this last week of 2009 before the New Year begins. See you too soon Blue Bunny - thanks for coming back and telling us about your Hardwick ..
What glorious decorations and a great story, to boot! 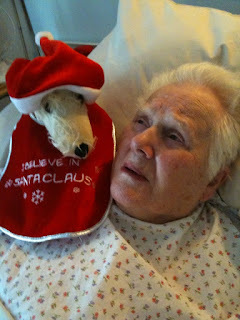 Thank you for sharing these pictures, Hilary --- they made my heart feel all warm and tingly, and put a smile on my face. Happiest holidays to you and your mum! Hi Megan .. thank you - Mum certainly loves them, the staff come in and chatter with Mum about them, other relatives peer in the room and admire .. so all in all thank you - they do make our hearts warm and tingly, especially Mum and she's thoroughly enjoyed herself this year. Thank you - we are enjoying being together en famille ..
You know after all these time read about your mother. This is the first time I see photos of her. You did a wonderful job with your mom's room and I enjoy see all of the photos. It make me feel closer to your mother. Thank you for sharing. Happy Holiday. Hi Gio .. thanks for coming over - and glad you liked the decorations and seeing pictures of my Ma - it's been fun and she feels included and has enjoyed the fuss and bother - ie some decision making! Not too much -- otherwise I'd still be decorating .. with her instructions from the bed! 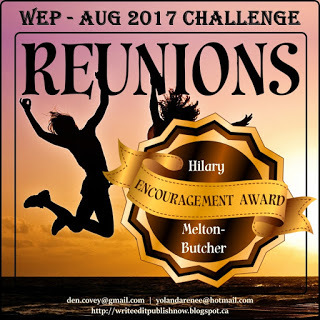 Hilary, you have a wonderful sense of humour and so does your mom! 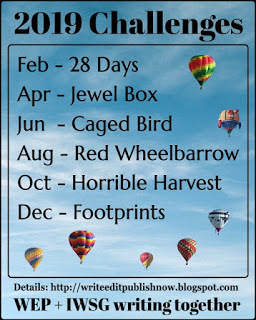 Love the festive spirit that resonates form the photos and words here. Many thanks for all your insight and feedback in 2009. Every moment is enriched when you share th real you. Your life is partly about achieving balance and every choice you make is helping you bring everything together. Peace, love and friendship. May every moment expand and inspire you. At the moment I'm at the airport, taking my own mum to Bangkok for a long weekend of shopping and eating. Here's to mothers! Happy new year Hilary - may it bring lots of love, peace and joy. Hi Liara .. good to see you here. Mum is certainly enjoying Christmas this year with the new decorations etc. Thanks for your support - the balance is coming back, the more I can grow and learn will also help bring things together .. yes I look forward to the moments expanding and inspiring me. Hi Daphne - thanks for coming over .. and so pleased you can relate to the pics of Mum .. and that you feel she's an old friend - she'll be pleased to hear that. How wonderful .. off to the big City - enjoy your long weekend together .. a lovely thing to share! As you say here's to mothers .. they inspire us ..
You too Daphne - have a brilliant 2010 .. with all your plans coming to fruition ..